If there’s any way I can make part of a recipe on the grill this time of year I will. The recipe for this post is no exception. I have a Big Green Egg smoker and a Weber gas grill and I use them both for different reasons. If I want quick and easy, the gas grill wins. If I want amazing flavor, I’ll fire up the BGE. Because the Egg is a little more work, I usually cook several things at once to take full advantage of a smoking session. For this recipe, I wanted to quickly smoke the chicken on my gas grill. This link discusses several methods for smoking on a gas grill. I have a small smoker box that I place over one of the grill burners, but you can easily create a makeshift smoker box with aluminum foil. You won’t get the intense smoky flavor on a gas grill that the Egg produces, but I like the more subtle smoke flavor you can achieve on the gas grill. This post is the third of a Mexican trilogy. You’ll need to reference the posts for enchilada sauce and guacamole to complete this recipe. The only thing that you’ll need to complete this Mexican meal is an ice cold margarita. One of my favorite grilling cookbooks, Weber’s New Real Grilling, contains an abundance of mouthwatering recipes. This recipe was adapted from this book. 1. Season chicken thighs with salt and pepper and drizzle with 3 tablespoons vegetable oil. Prepare smoker box with wood chips and place on grill. Continue heating until wood chips are smoking. Grill chicken thighs for 5 to 6 minutes on each side or until internal temperature reaches 165 degrees. 2. Remove chicken and grill tortillas on each side for 30 to 45 seconds until slightly browning. When chicken is cooled, chop into bite-sized pieces. 4. In a medium skillet, heat 2 tablespoons vegetable oil over medium heat. Saute onions and and garlic for 3 to 4 minutes until onions are translucent. Add green chiles, stir to combine, and remove from heat. 5. To assemble the pie, spread 1/2 cup of enchilada sauce in the bottom of a 12-inch iron skillet or a 9x13 casserole dish. Place 6 tortillas in an overlapping pattern on top of the sauce. Spread half of the chicken over the tortillas, followed by half of the onions, garlic , and chiles mixture. Next, add half of the corn and black beans. Spread 1 cup of enchilada sauce and top with 1/3 of the cheese. 6. Repeat the same layers. Top the pie with 6 tortillas, 1 cup of enchilada sauce and the remaining cheese. 7. Bake for 20 to 30 minutes or until the sauce is bubbling and the cheese is melted. Let sit for 10 minutes before serving. Garnish with chopped cilantro. Serve with guacamole, tortilla chips, and sour cream. Who doesn’t love a good batch of enchiladas? 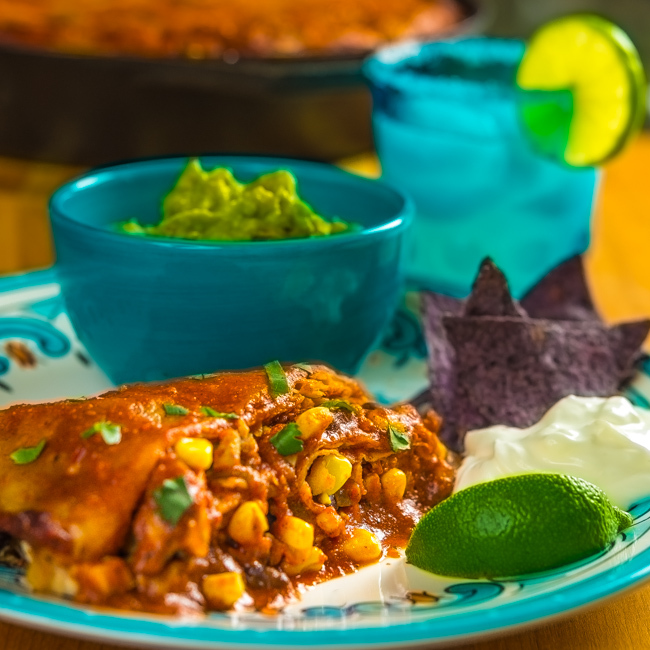 You certainly have moved the standard chicken enchilada casserole up a notch or two with the smoked chicken. Bobby doesn’t all of the smoking on our gas grill and it looks like he is going to be smoking some chicken thigh soon :). BTW – I have to agree that chicken thighs is the only way to go in enchiladas. White meat just doesn’t work for me. Haven’t tried smoked chicken before but this looks delicious. This sounds fab! And the Green Egg is just wonderful. A coworker of mine has a Green Egg and as soon as spring rolls around, he starts talking bout his Green egg with so much passion, I sometimes think he is speaking of his wife! But, tating the chicken that it cooks – I can say I understand! Wonderful recipe Bill-I guess fresh chilies can be subbed out for the canned for a little more heat? Btw, gorgeous photos too! Oh, wow, this looks amazing! The smoked chicken must really kick it over the top. Wish I had a smoker! I’m going to have to try this one out soon. Love that you have a recipe for homemade enchilada sauce to go with it! I make chicken enchiladas all the time, but not smoked ones! Love this idea. I have both a Weber gas grill and charcoal kettle grill, and use the latter as a makeshift smoker. Works OK, but just OK. I really should look into a Big Green Egg or the Weber water smoker. Good post — thanks. My family will just love this. I am talking about my Texan side of my family not my little daughters. Ha ha. Maybe a bit much for their little palates. Though you never know. I love grilling everything too. But I am so jealous of your green egg. On my wish list!